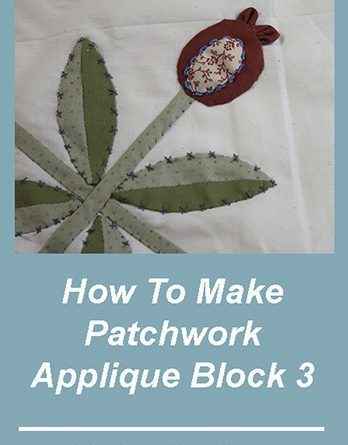 How to make patchwork – applique block # 3, it’s part of a series of tutorial to make 6 applique blocks to make a mini quilt. If you love to make mini quilts and if you love to make hand applique; I’m sure you’ll love to quilt along with me while I work on this Baltimore mini quilt. I have two more post on my blog where you can find the blocks 1 and 2 with their full tutorial and the FREE patterns and templates to download. This time I’m working on a new block with four flowers made of petals and this block also has four leaves made of two different fabrics, easy and fun to make, I’m sure you will enjoy making this block. Some different pieces of fabric of different color and small prints. Two pieces of fabric of 1 1/4″ x 13″ , one piece in light green and one piece in a different tone of green. I share some affiliate links on this post, when you click on them you can buy the same quilting tools I use to make my quilts at their regular price and I will get a small % of their price, this way you help me to keep working on my quilts which I share the patterns, templates and tutorials so you can make them tool. You can download the FREE pattern and templates here. 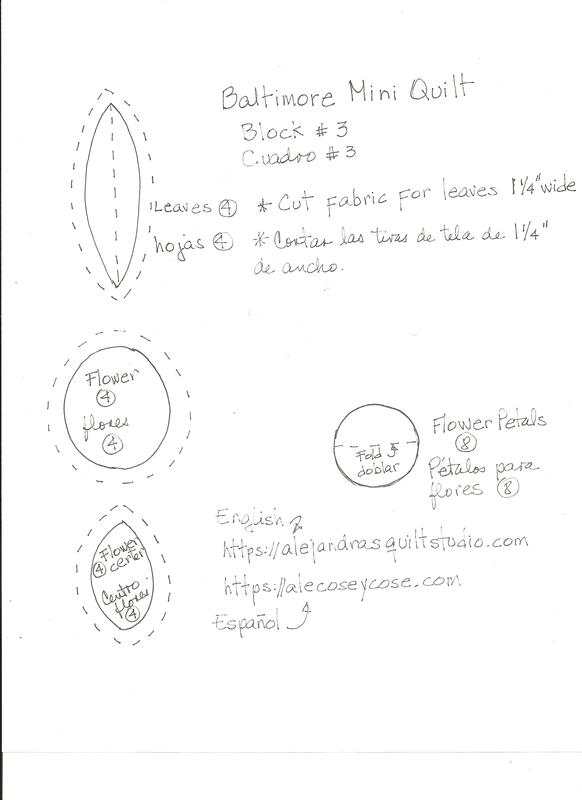 I made the video in Spanish, but I think it will help you to see how I work while I made the block 3 for the mini quilt Baltimore, I describe the step by step in English for you below. Tutorial to make the block 3. As I did with the block 1 and 2, I fold the fabric for the block twice diagonally to press and mark the center. When I get the pressed lines to show each corner, I mark down with a pencil where I need to sew the bias to make the seams for this block. I use the applique technique to sew the bias pressed with a warm iron by the middle all along the bias, I place the bias right next to the line where the seam will be, and I make a running stitch or I use the sewing machine this time to do this step. I fold the folded side of the bias over the bias and I do the hand applique to close the bias. To make the leaves for this block, I cut the strips to make the leaves and I sew them with the sewing machine. This time I pressed this piece opening the seams. I traced the shapes of the leaves on the fabric and I cut out each piece adding the seams. I place the paper leaf template in the back of each piece and I fold to the inside and mark the seam with my fingers. With the help of a pin I place each piece on its place while I do the hand applique. 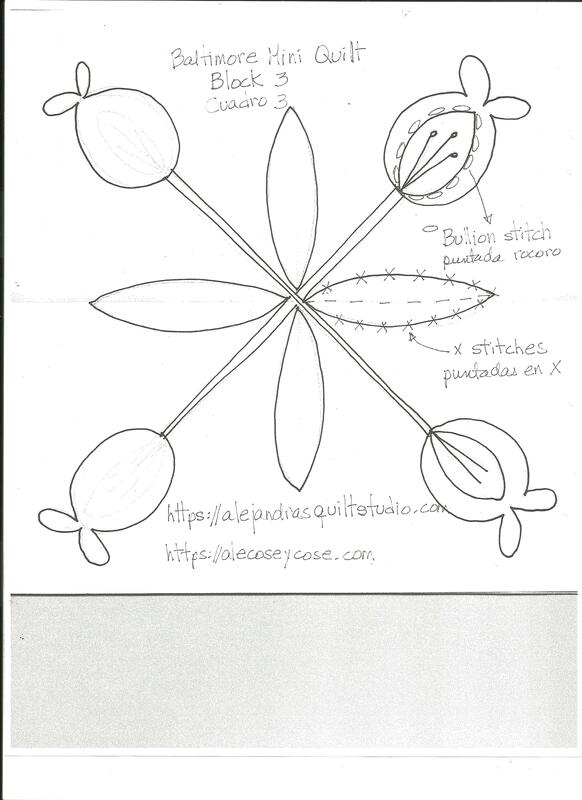 On this photo, you can see how the block 3 looks like when I finished the applique of the 4 leaves. As the leaves are big enough this time, I trimmed out the fabric on the back of the block to make the quilting easier. To applique the flowers, I worked the same way each piece to make the flower as I did with the leaves, I used the paper template inside in the back of each piece then I did the hand applique. To make the two petals in each flower, I made them with the yo-yo technique, I folded each circle in the middle and I made the running stitch all along the curved side, I pulled out the thread, I made the same with the second circle and I place them on the top of each flower before I finish the applique. To hole the petals on its place, I just did a couple of stitches on each petal to hold them on their places. When the flowers where finished, I placed this block on the loop to work the embroidery. The embroidery on this block is simple to work. I just did some X stitches on the edge of each leaf, and buillon stitch on the edge of the center of each flower. This photo below is a close up so you can take a look to the embroidery. Block 3 is now finished and you can take a look on how the three blocks looks like together. Congratulations you have finished the block 3 to make a Baltimore mini quilt along with me. 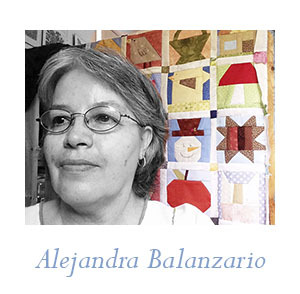 Now you can follow me on Facebook on my fans page Alejandra’s Quilt Studio, on Pinterest and on Instagramto get the sneak peeks on my work! If you want to make this Baltimore mini quilt, you can PIN IT to your Pinterest account so you can find it later. I thank you for visiting my blog and share it!